Loretta Realty’s goal is to assist you in selling your home in the fastest amount of time for the highest price and with the fewest hassles. This means your house must be ready for market, priced correctly, made available to show and let us put our negotiating experience to work for you. Over 94% of buyers find their home on the internet in today’s market. Make sure you choose an agent who has a specialized marketing program that helps your home get the attention it deserves. Flyer boxes, post card announcements and open houses were great marketing tactics back in the 90’s, but not today. We will share recent comparative market sales data, evaluate your homes condition and the special amenities as well as any obstacles that may affect your home’s value and time on market. Your home is a great candidate for a finite number of buyers. Remove the obstacles between the buyer and selling your home. We call our technique the “BULLS EYE” approach. We evaluate market activity and advise you of the steps necessary to help you reach our goal of selling your home. While it is important to know what has sold, equally important is what the current competition is, as well as who failed to sell. This information becomes even more meaningful when interpreted through the eyes of experience. We will evaluate the supply and demand ratios of your neighborhood. This is how we determine the ceiling of what the market will bear, as well as the average marketing time for your neighborhood. Staging can shorten time on market. Staging a home isn’t just about the correct placement of furniture and accessories. It is also is important to make sure that your house has a clean and fresh look. This might mean a fresh coat of paint or a cheery plant but you can rest assured we will devise a successful game plan to sell your property. And yes; we will make a list of what “Not to do” before we list your home. Will you get your asking price? Our job as your agent is to carefully negotiate the best possible price and terms for you. Because of our volume of transactions, we have both the experience and awareness of the marketplace to guide your decisions. So what are you waiting for? 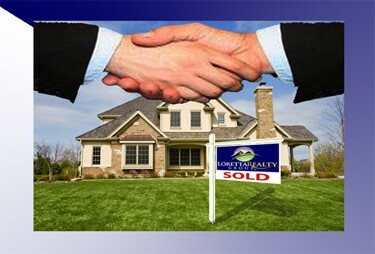 Contact Loretta Realty today so we can discuss your home’s market value right away.